In 2011 Andrew Hughes, the former manager of Trinley Estate and a committed supporter of the Andover Trees United concept, supported by his fellow Trustees, released the 44-acre field that was to become our planting site for the decade 2012-2021. Hampshire County Council agreed to buy the land for urban woodland creation in support of our community project and planting began in 2012 to commemorate HM Queen Elizabeth II Diamond Jubilee. The resulting woodland is the largest part of Hampshire’s Diamond Wood, one of 60 new 60-acre woods planted to mark the Jubilee, a scheme led by the Woodland Trust. In her capacity as patron of the Trust, Princess Anne planted the first tree in October 2012, joined by children from the inaugural Andover Trees United group of 17 schools. Harmony Woods is the 12-acre section within the Diamond Wood set aside to be planted by the community, led by the children of the town who bring their trees to plant over 2 weeks every year in late November, supported by their teachers and their families. By 2017, just over 5000 trees had been planted in Harmony Woods covering 7 acres. In 2018, a further 5 acres will be added to the existing area to allow planting to continue. A permanent wildflower meadow is marked out on the site of a (ploughed-out) Bronze Age burial mound, a circular hazel hedge is planted. A willow arch is woven and covered with British Legion red poppies to mark the start of the 1914-18 centenary, the third tree planting takes place during which the newly-planted trees are numbered with red tags. Community gardeners raise wildflowers from seed at home, 500 plants are raised and brought to the wood for planting in the meadow and the fourth tree planting takes place which includes the first section of hedgerow planting. More wildflowers are planted, a butterfly transect is registered with Butterfly Conservation and the first recordings made. 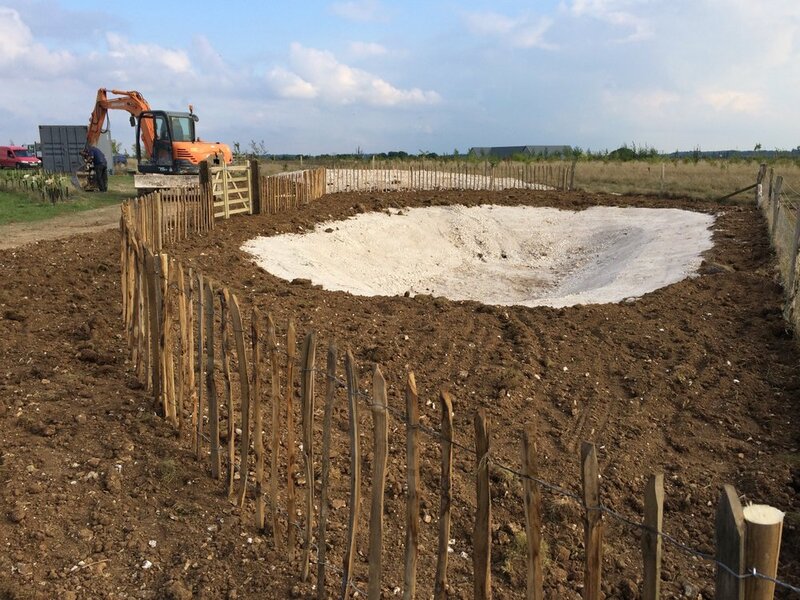 The stone access track is built, Southampton University archaeologists lead a community dig ‘Between the Barrows’, the wildlife pond is made, mains water is piped in. Hampshire CPRE planted their 50th anniversary tree in the wood, and a Holm Oak was planted to celebrate the Queen’s 90th birthday and the centenary of Capability Brown. The chalk mound created from the pond ‘spoil’ is seeded with chalk-loving wildflower seed, butterfly recordings continue. Taylor Wimpey donates and cranes in a portacabin for volunteers to use a base, the hazel arch is rebuilt and the sixth tree planting takes place completing the first 7 acres.